This is the first of young Weiss’s 7 albums that he chose to record live at a Portland, Oregon, club in order to offer the listener” live energy”. Hailed by Downbeat and others as being a unique composer/arranger, along with his renowned musicians, and influenced by Shirley Horn and Maria Schneider in his arrangements, pianist Weiss excels in swing, improve, and ballads. 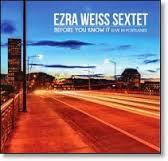 One hears influences from Horace Silver and Art Blakey, also. “The Five A.M. Strut” exemplifies his funky attitude as saxophonist John Nastos stretches the song over 15 minutes. It’s a strut, indeed! “Don’t Need No Ticket” slows to a ballad reminiscent of John Coltrane whose other tune, “Alabama”, a tribute to the 1963 bombings in Birmingham, is rearranged to mark a need for healing after the 2012 shootings at Sandy Hook Elementary School in Connecticut. “Before You Know It” with its gospel feel, was written for his not-yet-born son. Its lilting ballade turns funky, and again, fun. Weiss’s musical choices and presentations are powerfully moving, as is this live album, released last September on Roark Records label.